Todd Bowles and Matt Nagy will face off Sunday when the Jets head to Soldier Field, but this matchup’s visiting coach wanted Nagy to be his offensive coordinator last year, Manish Mehta of the New York Daily News reports. The Jets ended up hiring the since-fired John Morton to be their OC in 2017, but Mehta writes Bowles’ top choice to replace Chan Gailey was Nagy, whom he’s known for decades. 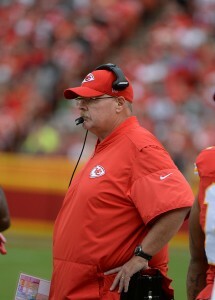 However, Nagy did not take an interview, continuing as Andy Reid‘s top offensive lieutenant with the Chiefs. Reid did not want to lose Nagy, per Mehta. 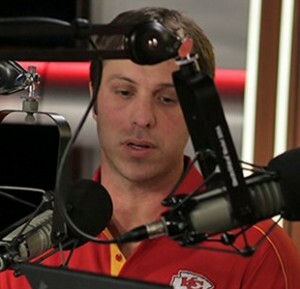 Nagy stayed in Kansas City and served as a part-time play-caller last season. That ended up being a critical decision, with Nagy overseeing a dynamic Chiefs offense — one that continued to incorporate college concepts and doubled as one of the league’s most innovative attacks — and the season leading to the Bears hiring him as their head coach. Jeremy Bates is now the Jets’ OC. Bilal Powell‘s career may be in jeopardy. The Jets placed their longtime passing-down running back on IR today, and the neck injury Powell’s sustained will need to be surgically repaired. Bowles said (via Rich Cimini of ESPN.com, Twitter link) this could be a career-threatening setback. Powell’s played with the Jets since arriving in New York as a fourth-round pick in 2011. He’s by far the longest-tenured Jet, having served as a backfield complement to the likes of LaDainian Tomlinson, Chris Ivory and Matt Forte. Patrick Peterson is either off the market, or the Cardinals are orchestrating an impressive smokescreen, so cornerback-needy teams will need to look elsewhere. Some are gauging whether the Raiders would trade another Reggie McKenzie first-round pick, with Jason La Canfora of CBS Sports tweeting teams are inquiring about Gareon Conley. Janoris Jenkins is the other player contenders are monitoring, but Conley is only in his second season. He is, however, one of the many Raiders who’ve seen their stock drop under Jon Gruden. The Raiders benched Conley prior to their London game; he’d started the previous five Oakland games after missing almost all of his rookie season due to a shin injury. However, the Raiders aren’t believed to be ready to part with Conley. JLC adds the Eagles, Patriots and Steelers are among the teams exploring what it would take to land a corner. An NFLPA grievance against the Bengals filed on behalf of Eric Reid did not go in the union’s favor, Mike Garafolo of NFL.com reports. An arbitrator denied the grievance, ruling the Bengals were within their rights to ask the then-free agent safety if he planned on continuing to kneel during the playing of the national anthem. The NFLPA argued the Bengals passed on Reid solely because of the anthem controversy, per Garafolo. Now on the Panthers, Reid has knelt during the anthem with Carolina. His collusion grievance against the NFL is still pending and isn’t expected to be heard in the near future, Garafolo adds. Andy Reid and Clark Hunt were not yet on board with Marcus Peters as a long-term Chiefs component, Ian Rapoport of NFL.com notes (video link). Concern inside Chiefs headquarters centered on a possible Peters extension, per Rapoport. The fourth-year cornerback is now eligible for a long-term deal, and it’s fairly clear the Chiefs had significant reservations about being the team that signed the accomplished corner to that contract. And that issue may have been forced this year. But Peters’ issues in the locker room played a key part in the franchise wanting to trade him, Rapoport reports. The Chiefs knew Peters would demand to be the NFL’s highest-paid corner, Terez Paylor of the Kansas City Star reports, leading to this preemptive strike. Peters is set to make barely $3MM this season, and the Rams are now responsible for picking up his fifth-year option — which they surely will given the timing of this trade. Peters skipped OTAs last year, and Paylor notes a possible training camp holdout could have transpired this summer. A 2016 first-team All-Pro and 2015 defensive rookie of the year, Peters received his best Pro Football Focus assessment for his 2017 work. Entering his age-25 season, Peters has 19 interceptions. He forced a career-high five fumbles in 2017. Here’s more from the Peters front. Rapoport reports this Rams/Chiefs deal will bring a package of picks to the Chiefs, but none of those is believed to be a first-rounder. That will mean the Chiefs still do not have a 2018 first-rounder after shipping it to the Bills in last year’s Patrick Mahomes deal. Kansas City picked up an extra third-rounder in January’s Alex Smith deal and collected a compensatory sixth-rounder in this draft as well. The Rams already shipped a 2018 second-round pick to the Bills for Sammy Watkins, so this latest trade could leave Los Angeles’ selection supply weakened. Wade Phillips‘ strong personality should mesh well with Peters’ polarizing style, Bucky Brooks of NFL.com tweets, recalling a conversation he had with a veteran defensive backs coach when Peters was draft-eligible in 2015. Phillips’ ability to get through to Aqib Talib helped the Broncos’ mercurial corner craft the most memorable portion of his career, with Talib helping the Broncos to a Super Bowl title in his first season with Phillips and landing on the All-Pro first team in his second. The 49ers were also interested in Peters, with the Browns’ interest being disputed, but the Seahawks were not exploring a Peters back back to Seattle despite his history in the city, Bob Condotta of the Seattle Times notes. Peters was kicked off the University of Washington’s team during the 2014 season. Additionally, the playmaking corner measures just under 6-foot and has 31 1/2-inch arms. Pointing out the Seahawks haven’t drafted a boundary corner with arms shorter than 32 inches during Pete Carroll‘s tenure, Condotta writes Peters may not have been a fit in Seattle. Hue Jackson will be taking on a CEO-style approach this season and shed light on why he thought Todd Haley‘s experience was sufficient to unseat him as Browns play-caller. Jackson confirmed Thursday that Haley will call plays, just as he did in Pittsburgh. “This is something I’ve always dreamed of transitioning into,” Jackson said (via Mary Kay Cabot of cleveland.com) of an arrangement where he will oversee the offense while an OC calls plays. “For the first two years I didn’t think there was somebody out there that could do it better than myself. I’ve said that from Day 1, I just don’t think that’s fair. Here’s the latest from AFC staffs. Brian Callahan‘s received interest from the Titans and Jets since he and the Lions parted ways, with the former scheduling an OC interview that took place Wednesday. However, the Raiders are in the mix for Callahan now too. Callahan will interview for Oakland’s quarterbacks coach position, Jason Wolf of The Tennesseean reports. The Jets view him as a fit for their QBs job as well and are interviewing him for that role. So, the former Broncos and Lions assistant has options. As Jackson transitions away from play-calling responsibilities in Cleveland, Andy Reid will pivot back to them in Kansas City. The sixth-year Chiefs HC will call plays in 2018, he said Thursday (via Terez Paylor of the Kansas City Star). This could be expected since Reid lost Matt Nagy, who called plays for the Chiefs late in the season, to Chicago. New OC Eric Bieniemy has never called NFL plays before, and Reid maintained play-calling duties during the start of Nagy and Doug Pederson‘s tenures before ceding those reins toward the end of their respective runs. Reid revealed he called plays in Week 17, which was Patrick Mahomes‘ NFL debut, despite a run of success for Nagy late in the season. That interruption could be notable since Mahomes could well be K.C.’s starter in 2018. Josh McDaniels‘ second interview with the Colts will take place on Friday, sources tell Tom Pelissero of NFL.com (on Twitter). McDaniels, who will take over as the Colts’ head coach after the Super Bowl, will sit down with owner Jim Irsay and GM Chris Ballard to make plans for the offseason. Per league rules, McDaniels cannot formally be named as Indianapolis’ new HC until after the Patriots’ season is over, so the “second interview” is the only way the two parties can meet in person. Chiefs head coach Andy Reid will hand over play-calling duties to offensive coordinator Matt Nagy for the team’s game against the Jets today, as ESPN’s Chris Mortensen tweets. Reid will “continue to have oversight” of the play-calling, per Mortensen, which means that he will retain veto power over Nagy’s decisions. Reid’s decision comes on the heels of a horrible stretch for Kansas City, which started the season 5-0 only to lose five of its next six. 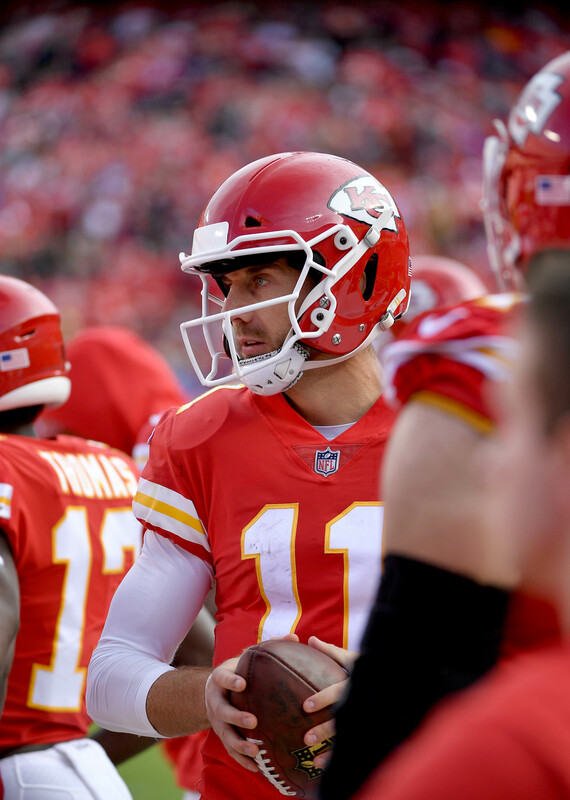 The Chiefs’ sputtering offense has been a big reason for its slide, and quarterback Alex Smith has experienced a precipitous drop-off in his quality of play after looking like a legitimate MVP candidate earlier in the season. Reid apparently decided enough is enough and is hoping a new voice in Smith’s ear will give him a bit of a boost. As Mortensen observes (via Twitter), this is not the first time that Reid has done something like this, as he has temporarily ceded play-calling responsibilities to his offensive coordinators in both Philadelphia and Kansas City. Even more interesting is Mortensen’s tweet concerning Smith himself. Although Reid has steadfastly supported his incumbent signal-caller — and just last week we heard that the Chiefs would only turn to rookie Patrick Mahomes this season if Smith were to get hurt — Mortensen suggests that, if Smith struggles against New York today, Mahomes could get the nod. Nagy, of course, is a popular head-coaching candidate who could get his first chance to lead an NFL team this offseason. Poll: Should The Chiefs Start Patrick Mahomes? The Chiefs looked to be one of the best teams in the NFL after a 5-0 start. However, the team has taken a nosedive as of late, losing three straight games and dropping five out of their past six. 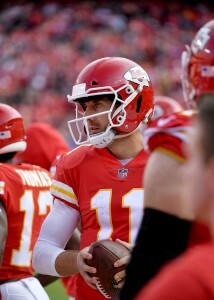 A major reason for the hot start had been the outstanding play they’d been getting from veteran quarterback Alex Smith. Known as one of the better game managers at the position, Smith had been criticized for his inability to carry the Chiefs to victory on his own. However, Smith was a legit MVP candidate earlier in the year, throwing the ball down field more, while continuing to limit mistakes. The team already had a solid roster across the board, considering that they finished as the AFC’s second best team heading into the playoffs last season. Smith also was given exciting playmakers in TE Travis Kelce, WR Tyreek Hill and rookie RB Kareem Hunt. Still, even with all these weapons and a weak conference, the Chiefs find themselves in a real fight to just make the playoffs. This has led to speculation that Kansas City could turn to rookie backup Patrick Mahomes for a little shot in the arm. Although the team clearly thinks highly of their 2017 first round pick, head coach Andy Reid stayed committed to Smith after the Chiefs loss today. That’s not where I am at right now,” Reid said in today’s postgame press conference (Twitter link via Ian Rapoport of NFL.com). Reid is notably close to the vest, but even he can’t deny that his team is in a bad way right now. Replacing Smith with Mahomes would be a huge risk considering that despite his great raw ability, the former Texas Tech QB was classified as incredibly raw coming into the draft. It’s a storyline that we didn’t think would hold any credence given the Chiefs fast start, but there might be increased noise to make this move if Kansas City can’t turn things around in the weeks to come. Chiefs coach Andy Reid said he was not involved in the evaluation process in promoting Brett Veach to GM (Twitter link via James Palmer of NFL.com). The Chiefs promoted the 39-year-old earlier this month, and reports indicated that while Veach will have control over the roster, he’ll ultimately work in tandem with his head coach. Here’s something that could affect the Browns‘ roster bubble: Duke Johnson profiles more as a wide receiver right now than a running back, Mary Kay Cabot of the Plain Dealer writes. Johnson is the leading candidate to replace Andrew Hawkins as the team’s No. 1 slot receiver and has been split out wide at times in practice. After carrying the ball 104 times as a rookie, Johnson ran the ball only 73 times in 2016 and he could be looking at another reduction this year. The Colts have not had substantive extension talks with left guard Jack Mewhort as he enters his contract year, Stephen Holder of the Indy Star tweets. Mewhort has started at left guard with some appearances at tackle since entering the league in 2014. Unfortunately, the former second round pick saw his season cut short last year due to a knee injury. Mewhort has graded out as a starting caliber player for the Colts in each of his NFL seasons. In 2016, he was PFF’s 23rd ranked guard. Titans guard Sebastian Tretola apparently suffered a minor injury from a bullet, and ESPN’s Paul Kuharsky tweeted a statement from the organization: “We are aware of the reports that Sebastian received treatment for a wound when he was grazed by a bullet…He has been released from the hospital and is thankful for only a minor injury.” The 2016 sixth-round pick appeared in only one game as a rookie last season. Following news that Chargers wide receiver Mike Williams might need season-ending surgery on a herniated disk in his back, ESPN.com’s Eric D. Williams explored whether the team could bring back veteran Vincent Jackson. The writer ultimately believes that he wouldn’t be a fit, as the team could rely on a number of young players to fill the void. Alternatively, the team could opt for a number of free agents (including Stevie Johnson and Vincent Brown) who are more familiar with the team’s current offensive scheme. Jackson spent the first seven seasons of his career in San Diego, earning a pair of Pro Bowl selections. When the Chiefs promoted Brett Veach into the GM role, there were questions about exactly how much control he would have. On Monday, owner Clark Hunt clarified things a bit. Veach will have final say over the 53-man roster, Hunt tells reporters. He’ll work in tandem with coach Andy Reid just like John Dorsey did when he was in GM, but it appears that Veach is in the driver’s seat. There has been speculation that Reid helped to push Dorsey out the door and Hunt acknowledged that he spoke with Reid before making the decision. He did not get into specifics about Reid’s input but, as expected, the move was not made without the coach being consulted first. There was no one single event that caused the firing of Dorsey, Hunt explained, saying that it was based on an overall evaluation of his work. That means the team’s awkward parting of ways with wide receiver Jeremy Maclin was not the impetus for canning Dorsey – if Hunt is to be believed. Hunt says his goal is for the Chiefs to win a Super Bowl in the next 3-4 years, meaning that expectations are high for the young GM. Chiefs head coach Andy Reid has played “little to no role” in the club’s general manager interview process, according to Jason La Canfora of CBSSports.com (Twitter link), who reports owner Clark Hunt and president Mark Donovan are leading Kansas City’s search. As La Canfora notes, Reid’s lack of presence in the Chiefs’ GM quest further confirms previous reports that it was Hunt — not Reid — who was responsible for firing general manager John Dorsey. Indeed, sources told Terez A. Paylor of the Kansas City Star last month that Dorsey’s ouster was prompted by Hunt’s concern about Dorsey’s lack of internal communication and casual management style. Although Reid is not overly involved in the Chiefs’ GM search, and reportedly won’t take on a larger personnel role, that doesn’t mean his fingerprints aren’t on the club’s hunt. Kansas City co-director of player personnel Brett Veach and ESPN commentator Louis Riddick, considered the top candidates for the Chiefs vacancy, both have professional ties to Reid. Earlier today, La Canfora indicated Veach could be promoted LINK to general manager before the start of training camp. Despite what owner Clark Hunt stated in the Chiefs’ press release, Kansas City and Dorsey did not “agree to part ways,” a source tells Adam Schefter of ESPN.com (Twitter link). Rather, the Chiefs decided to fire Dorsey, and the decision was made by Hunt, not Reid, according to Mike Florio of Pro Football Talk. The Chiefs weren’t pleased with how Dorsey handled contract negotiations with the team’s premier players such as Justin Houston and Eric Berry, reports Tom Pelissero of USA Today (Twitter link). Kansas City waited until the last minute to work out deals with Houston and Berry (after using the franchise tag on both), and the delay in talks ended up costing the Chiefs down the line. Dorsey reportedly told a confidant that he and Hunt were “butting heads” within the past two months, tweets Jason Cole of Bleacher Report. Dorsey didn’t elaborate on the issue at hand, but it conceivably could have been related to how Dorsey handled Houston and Berry’s contracts, or about Dorsey’s own pact with the Chiefs. Reid will not take on a more active role in personnel, according to Sam Mellinger of the Kansas City Star. Reid, notably, was the Eagles’ de facto general manager from 2001-12. Additionally, Reid and the new general manager will both separately report to Hunt, the same arrangement utilized by the Reid and Dorsey tandem.